During vacations, extended snow period or a just ordinary weekends and holidays, your children deserve to be happily occupied with quality toys, as RC trucks. Adult hobbyists, casual users, and racers who like to let their fun part take over will also get countless hours of entertainment with these small yet powerful gadgets. These little vehicles are preferred because they perform amazingly well in different terrains including sand, grass, carpet, dirt, open road, mud, puddle, you name it. 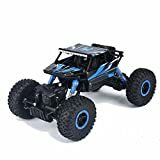 So that you get a thrilling performance, we decided to bring you this solid overview of the best of these nifty appliances, to save you the hassle and confusion that comes with selecting the perfect RC truck so you can buy with confidence. Price: if you opt for a cheaper model, ensure you won’t dip out on build quality or performance. While some vehicles cost a fortune, don’t be disappointed. There are many other trucks out there that are affordable and serve their purpose excellently. Engine: if you intend to use your RC truck for racing, you may want a powerful engine with multiple motors so that you won’t lag behind. Ensure the option you have in mind performs like a champ on the worst surfaces including grass, rock, sand, open field, and loose dirt. Materials: Plastic is the most used material in the construction of an RC car. However, some makers use materials with higher quality for other parts. Look out for rubber tires, they are best at offering grip and cushioning. Power Source: Most RC cars need batteries to work. You’ll want to consider an RC car that contains battery packs so that you just need to charge them and you are always ready to go. Note that there are RCs with Nitro engines. This kind of engines may need batteries and fuel. Design: not all RC trucks can withstand harsh terrain; some are under-equipped for steep and rugged terrains. It is vital to consider useful design features like oversized rugged tires and an ergonomic scale design for optimum stability. Although this is one of the cheapest models, it doesn’t mean any lesser build quality or performance so you can buy with surety. The manufacturer prides themselves on the 1:18 scale design with large oversized tires with thick threads and a small upper which ensures stability and resistance to any form of crushes. The 4WD drivetrain paired with a powerful crawling technology and reliable, robust shocks supplements this ergonomic design to give an incredibly fast machine for the little monster it is. The thick tires are resistant to skid and operating this remote controlled vehicle is quite simple for any regardless of experience. Inside the package, you’ll find 7 AA batteries, 4 for the car and 3 for the remote. The makers recommend it for ages above eight years. This is a perfect excuse for any kid to get started in the racing hobby. The commendable performance can be partly credited to the PVC rubber wheels that maintain a firm grip on the surfaces as well as the 4WD system that delivers power to all wheels. Each tire comes installed with bouncing suspension springs for flexibility and stability especially when zooming through unstable surfaces. In the frequent case of a crush, worry not that the inner electronic components of your minute automobile are affected. This unit has been made shockproof with a direction spinner in the bottom so that the car can automatically adjust if it is veering off the path, this helps in preventing crashes. One does not require any assistance to operate this intuitive system as it is user-friendly. You get to drive forward effortlessly and backward, turn left or right and climb the roughest of terrains with this powerful little automobile. 20 minutes of enjoyment with a 3-hour full charge of the 4.8v 700 mA battery that is included. With every buy, you get a charge cable, three 1.5 V AA batteries for the 2.4 GHz remote. What else do you need other than this well built for the outdoors, powerful and torque-loaded option from Click and play? It is praised for being extremely easy to handle and maneuver and super fast and won’t break on the first run nor years to come. This rock crawler car boasts a 4WD drivetrain with anti-skid tires meaning the most rugged terrains will be his favorite. Apart from the high suspension shocks which aid in maneuverability, you will also enjoy an anti-collision structure so that crashes won’t be so bad. With 4 AA batteries installed, you get to enjoy up to 6.2 MPh of racing. Best of all, it is so justly priced considering its caliber. You will need to purchase seven accompanying AA batteries, 4 for the vehicle and 3 for the transmitter. The 2.4 Hz tri-channel transmitter means it will not interrupt other frequencies with 2.7 Hz and allows for up to three vehicles. About 60 ft. of operation range. Tuptoel tries to set the bar too high for any RC track marker in the competitive market to reach. This mini-Jeep truck is durable, can never get old and will not get damaged by anything. It designed with a 1:18 scale, a four-wheel drive for all-terrain performance so it will tackle the trigged outdoors and high torque for climbing over the hills. Because there is a compelling off-road shock-proof system, you have nothing to worry about when making it flip, drift or turn. The off-road monster can take turns, twists, and knocks with ease. The 4.8 v battery requires 2-3 hours of charging to last up to 25 minutes. You enjoy 60+ meters of drive range. The car has two LED lights, so your driving is not only limited to daytime. A slightly more expensive means of outstanding off-road performance, the dynamic and luxurious details and finishes that are notable affirm that he is a pro. This RC truck boasts a 4wd and front and rear dual motors that produce unprecedented levels of torque. Resting on oversized PVC tires, there four suspension springs so that rocky and rugged terrain won’t bother this truck one bit. DOUBLE E was also reasonable with forwarding, backward, left-turn and right-turn and climb functionalities. The control range is incredible; you get to still be effectively in charge with your truck up to a whopping 260 feet away. A 2-3 hour full charge will power your track for at least 30 minutes. You get an 800mAh rechargeable 6V battery pack so you won’t have batteries dying on you amid thrilling fun. The package also features a USB charging cable and a screwdriver. The remote control requires 3 AA batteries. You don’t need to buy extra batteries; you get a 4.8v 700 mAh car battery installed. Up to 60 meters remote distance control. The package includes a USB charger cable. If you are scared of size, but you love speed, and control, then you should stay put on this review. This unit has a lot going for regarding features and offers quality that is rarely seen these days. What impresses most about this RC truck is the realistic 1/16 scale detailed design. With the lightweight construction, the 8-10 mph speed is pretty fast at takeoff and also climbs hills as though they are slopes. The only thing the competition should expect to see is dust. The truck handles great and is built tough with sturdy, explosion proof PVC material for uppermost durability. The price tag might be a little steeper, but it is sure to fulfill its purpose. The unit uses 3 AA batteries for the remote; you have to buy them separately. It comes with two rechargeable batteries that are accessible from the bottom; they can power the small truck for close to 15 minutes. 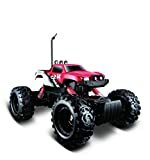 Just from how it looks, you can tell that the Maisto RC Rock crawler was meant for serious performance. The company took time to fit two motors and low gearing. This is not to be taken lightly, it the reason this fantastic RC truck is taking RC racing where it’s never gone before. It boasts an articulated front and rear suspension that takes care of terrains that are steep and rocky or rugged. You also find high-quality TPE tires with excellent tread that provides excellent traction and grip on loose soil or slippery surfaces. 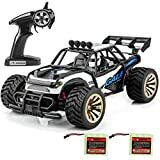 Like other reputable RC off-road vehicles, the electronics are well protected from water, wind and other destructive elements. A decent option you should surely check out. You are expected to purchase six separate AA batteries for the vehicle and 2 AAA batteries for the remote. Let’s up to three to game simultaneously if they have similar models of RC trucks. This unit distances itself from the park as a market-leader in the RC truck segment. 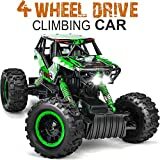 Apart from a unique 1:14 scale, it is known for extremely high speeds of up to 25 km/h and can handle the steep sections courtesy of the efficient 4WD system with separate suspension springs for each wheel. It’s also famed for bi-motor design so it can beat all terrains and a rugged oversized PVC rubber wheels that help in managing slippery surfaces and keeps it on its wheels especially on the rigged. The makers assure that this truck can move forward or backward, turn left or right and climb slopes. There is a direction trimmer at the bottom to ensure the vehicle moves in a straight line. There a provision for a 4.8 v battery though you can still buy two separate 1.5 v AA batteries if you wish to. All these options are great tires for ground clearance and great performance. Just what you will need if you plan on being a successful while off the road. 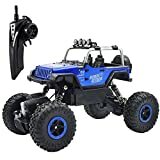 But if you genuinely have the money to invest in an RC truck, you really can’t go wrong with the SZJJX RC Cars Off-Road Rock vehicle. It is quite the beast in comparison to others in the bunch and smashes the competition with ease. With this pick in your cart, your little kid will enjoy blast cruising all over for years.